Back in the day, my girlfriend at the time turned me on to Cyanide and Happiness, a webcomic that was in alignment with my own twisted sense of humor. Now, a decade later, the keys to the universe are in the hands of me and 2-4 of my closest friends. Joking Hazard is a card game for people with a dark and twisted sense of humor. The box includes 360 cards, each a panel from a Cyanide and Happiness strip, and the instruction sheet. The game is pretty simple. Whomever's turn it is flips over a card from the deck, adds one of their own to the strip, and the remaining players try to end the comic strip in the funniest of ways. Yeah, it's a hilarious experience. The replay value is pretty high. We've played a few times now and it hasn't worn thin yet. I'm chomping at the bit to get the expansions for even more demented fun. 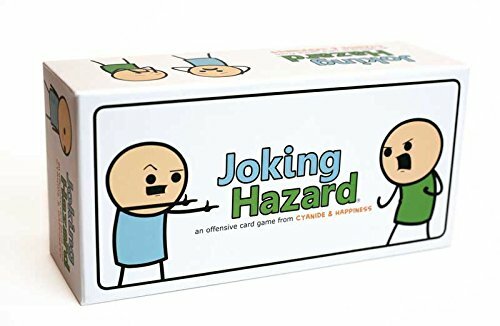 Joking Hazard is a hilarious game that should appeal to fans of Cards Against Humanity and dark humor in general. Five out of five stars.